To accommodate our clients we have four different bear hunting areas, ranging from spring hunts over bait on both private land and wilderness areas to private land spot and stalk and fly in wilderness bait hunts in the fall. 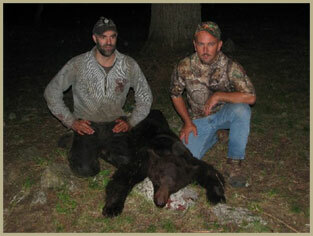 We have been baiting bears since 1979, and we produce more trophy bear than any of our competitors by a large margin. 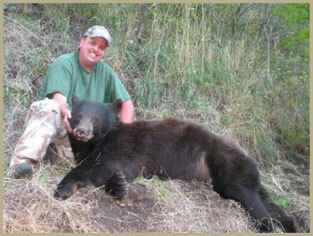 All of our bear hunts have been close to 100% opportunity. Both the wilderness and ranch bear hunts produce about 50% color phase with colors ranging from dark chocolate to cinnamon, blond and red. 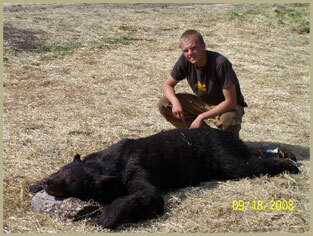 P&Y and B&C candidates are spotted every season with several hunters placing their 19" & 20" bruins in the literature. We offer a spring bait hunt in the Selway-Bitterroot wilderness area. This area is so vast and has such a high bear population that we have a very rare opportunity to be able to offer 2 bear tags in this unit. 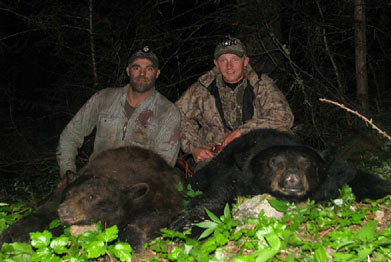 Many hunters will have the opportunity to take 2 bears during their hunt; some have even taken 2 bears in the same evening. These hunts take place on the Lochsa River and run from mid may to the end of June. During these hunts we stay either at our base camp lodge or we can do a pack-in wilderness tent camp. Like most bear hunts, we only hunt in the afternoon, since this is when we see about 90% of our bear activity on the baits. We have tree stands and ground blinds set up weeks in advance so the bears have time to get used to the bait area, making them more likely to come in during the daylight hours. We establish each bait for well over a week before we ever have anyone hunt over it, in order to ensure the best chance possible at a nice mature bear. To access the baits we use vehicles, on foot, horseback, and we also raft across the river to reach many never before baited spots. This is an any-weapon hunt, so one bear can be taken with a rifle and next with a bow, or even a pistol. On occasion we will do a mid-day hillside hunt to watch some open canyons that bears may be using to do some grazing earlier in the day. We do very well on this hunt at around 90% success, with opportunity easily reaching 100% annually. Bears on this hunt average from 510 to 66 in length, we will take some each year getting up to 7 feet long, with our largest being 8 foot. The bears this time of year tend to weigh in around 200-300 pounds. We also average about 50% on color phase bears. This hunt is 5 days and includes all lodging and meals. Over the years during our elk season we have noticed the large number of bears on our ranches, so about 10 years ago we started putting out some bear baits in the spring and it was a huge success. This has led to us offering a spring ranch bear hunt; this is a one bear area and is in a combo with up to 2 turkey tags. This hunt takes place on both our Joseph and Whitebird ranches in units 13 and 14. Access to the baits is fairly easy, usually we can drive right up to them by 4-wheeler. This is an any-weapon hunt so we can do archery, rifle or even pistol. As for success on the bear hunts we do very well, around 95% success on this hunt, with opportunity reaching 100% most years. Average bears are from 510 to 66, with some going 7 foot and larger. We also average about 50% on color phase bears. They range from dark chocolate brown to cinnamon, blonde, and red. This hunt is 5 days and includes all lodging and meals. We usually bear hunt only in the evenings and then turkey hunt in the mornings when the birds are coming out of roost. In the evenings we listen and can easily locate the birds so we can get you setup in the right place for the morning. There are lots of turkeys on the ranch and we rarely have trouble getting our clients at least one turkey during this hunt. We offer a very unique bear hunting experience with our fall hound/spot & stalk hunt located along the Salmon River breaks at our Whitebird and Joseph ranches. During the month of September the areas that we are hunting here hold thousands of wild plum trees which fill every canyon on the ranch with some of the tastiest wild fruit around. Bears come from the surroundings mountains down to the ranch in order to fatten up for the winter. We go out in the morning and try to catch a bear with the hounds, this makes for a very exciting hunt and tends to be very successful with the heavy bear population on the property. This hunt can be done by using any weapon you choose, could be rifle, bow, or even pistol. Then in the evenings we'll sit out on the hillsides and glass for bear walking the plum thickets. The hillside hunts usually produce shots in the 200-300 yard range so its strictly a rifle hunt. We hillside hunt over canyons filled with the large wild plum orchards, which the bears come down to in the evenings. We watch the bears cross the hillsides in search of the ripest fruit available, and try to get within shooting range. We usually see around 95% opportunity on this hunt with about an 90% success. The color phase on this hunt is about 60%, running from dark chocolate brown to cinnamon, blonde, and red. Average bears are from 5’10” to 6’6”, with some going 7 foot and larger. The bears also tend to be fatter this time of year, pushing them up into the 300-350 pound range, with some getting up to 400+ pounds. This hunt is 5 days and all lodging and meals are included.